2014 Part 1: 133 pp., Part 2: 123 pp., 24x15 cm, Pb. Sthiramati`s Pañcaskandhakavibhāṣā is an extensive 6th century Yogācārā commentary on Vasunbahdu´s Pañcaskandhaka, a short analysis of the five constituents of the person (skandha). The text was available until now only through its Tibetan translation and is presented in these two volumes in its Sanskrit original for the first time. As one of the few Abhiddharmic works of the Yogācārā school known to be extant in Sanskrit, the text is a significant source for the technical terminology of this tradition, providing valuable information on the Buddhist analysis of human nature and on the process of reshaping the canonical concept of the five constituents, twelve bases (āyatana) and eighteen elements (dhātu). The present study therefore aims at establishing the basis of future work on these topics by offering critical and diplomatic editions of the text. The first volume includes a critical edition based on a photocopy kept in the library of the China Tibetology Research Center (Beijing) of a codex unicus preseverd in Lhasa. In addition the Tibetan translation of the text and various related works have been consulted. 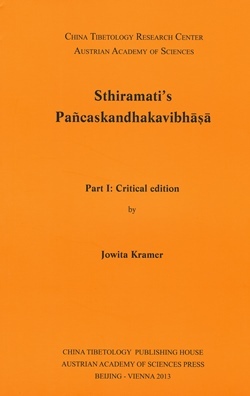 The critical edition is preceded by an introduction to the concept of the five constituents and by a descriptive analysis of Sthiramati`s commentary. The second volume offers some information about the manuscript and a diplomatic edition of the text.